The injection-molded shell with I-beam chin bar offers the latest in thermoplastic alloy technology and is lightweight, something every rider wants. This helmet has five vents: two adjustable forehead vents, two rear venturi exhaust vents as well as a flush-mounted chin vent. All this venting is designed to help keep your head cooler and drier. 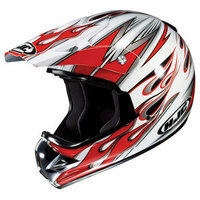 The vented visor has aluminim side screws to make adjusting it a breeze and also matches the helmet's graphics. Other features include an integrated non-slip goddle strap holder, chin strap that secures neatly, perforated nylon liner with mesh trim, and an enlarged eyeport opening to give you greater visibility while handling that tough course.